The Los Angeles Design Challenge 2012 looks far ahead with a quest for the “Highway Patrol Vehicle 2025”. Law enforcement will have to prepare for even more crowded roads with electronically monitored and guided traffic, a much larger population and changes in human behaviour. People will feel young and active until even later in life. Outdoor activities will dominate leisure, the desire for freedom and adventure. The new times will also call for new police vehicles. They must be able to reach any place conceivable quickly and reliably – even far away from any pavement. And they must do so in an exceptionally environmentally friendly way using alternative energy sources. Enhanced green-car characteristics and off-road capabilities will be among the fundamental virtues of a police car in 2025. The small glass areas make the police vehicle a safe cocoon for law enforcement officers who are faced with many dangers. Emergency lights integrated into the roof ensure attention that is impossible to ignore; the striking front leaves no doubt as to the commanding presence of the police, and the gigantic wheels guarantee the right of way even where no way exists. Of course the concept of the Ener-G-Force for the Los Angeles Design Challenge is pure, rendered science fiction. 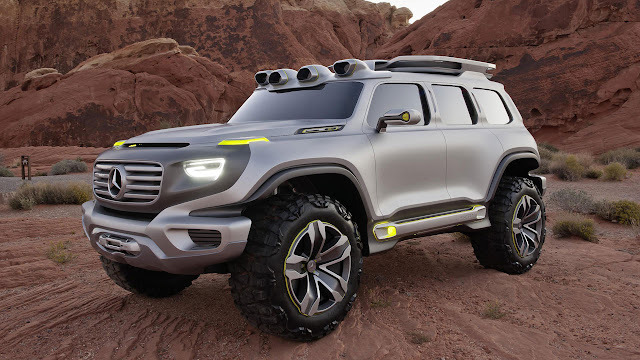 However, the notion of designing tomorrow’s off-roader fascinated the designers at the Mercedes-Benz Advanced Design Studio in Carlsbad, California to such an extent that they evolved the vision of a police version into a civilian version and even built a 1:1-scale model. Like the “Highway Patrol Vehicle 2025”, the shape of the civilian Ener-G-Force is modelled after the G-Class, the off-road icon whose continuous history goes all the way back to the 1970s and that to this very day still tackles the future as a stylistically and technologically advanced SUV. 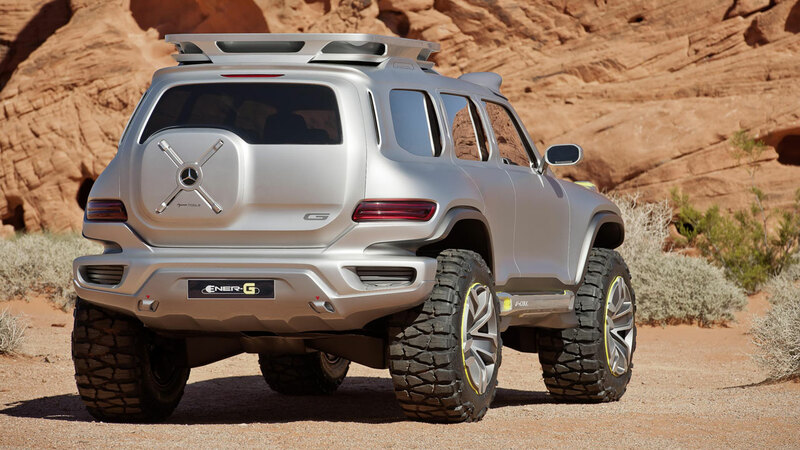 Like the police version, the model of the civilian Ener-G-Force is unmistakably inspired by the G-Class, which has long been considered an automotive icon. However, it presents a radical reinterpretation of this classic that looks far into the future. Important genes such as proportions and design elements were adopted conceptually and completely redesigned and updated in a clean concept for beyond tomorrow. Ener-G-Force Designer Hubert Lee: “Of course we wanted to take a clear step forward, but we also wanted the G’s characteristic features.” The Ener-G-Force has a similar profile, however with a high shoulder line and scaled-down glass areas. While the clear design idiom of the G-Class has remained, all surfaces are designed to express intensity and tension. The meticulously executed details also are a clear indication that the Ener-G-Force is the product of modern times. 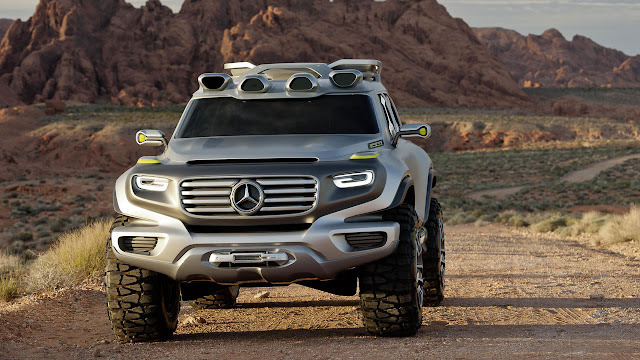 Like the G-Class, the Ener-G-Force sports a front with an expressive radiator grille that incorporates the headlamps. LEDs in the headlamps form lamp units in the shape of a G. This gives the Ener-G-Force a strong, iconic appearance and demonstrates dominance. The front indicators and position lights are mounted on top of the wings as a significant G-Class element. The mounted roof distinctive to the G-Class and the tripartite glass area also cite the fundamental genes of the classic off-roader from Mercedes-Benz, but represent a clear step forward. 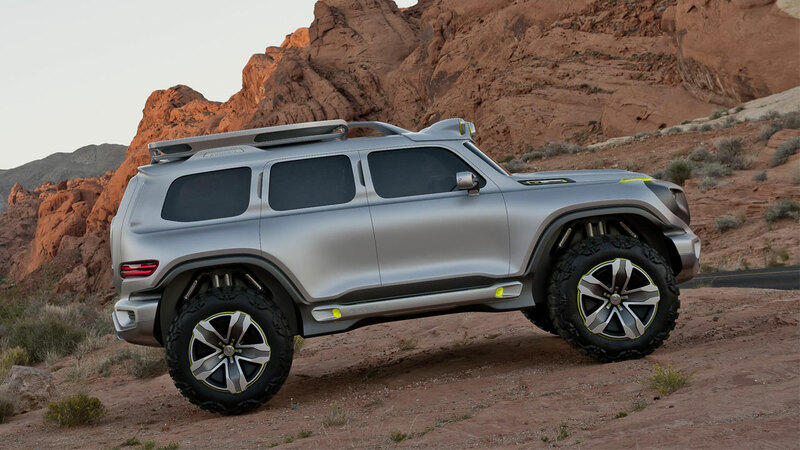 This is also evident in the large wheels, whose 20-inch rims give the Ener-G-Force a powerful, towering stance. The Ener-G-Force also plays on the utility factor in an entirely new way. For instance, the distinctive feature in the rear is a slightly off-centre pull-out compartment whose cover takes up the characteristic look of the spare wheel carrier of the classic G-Class. This pull-out tool box can hold a wide variety of equipment items that consequently are quickly in reach without having to open the whole liftgate. The Ener-G-Force stores recycled water in tanks on the roof, and transfers it to the “hydro-tech converter”, where natural and renewable resources are converted into hydrogen for operating the fuel cells. The storage units for the electricity generated in this process are housed easily accessible in the striking side skirts. The Ener-G-Force emits nothing but water, has an operating range of about 800 kilometres and as a result truly is a green car. Four wheel-hub motors, whose output for each individual wheel is adapted precisely to the respective terrain by high-performance electronics, provide the pulling power. A “Terra-Scan” 360-degree topography scanner on the roof permanently scans the surroundings and uses the results to adjust the spring and damping rates as well as other suspension parameters for maximum traction on the respective surface, regardless of whether it is in terrain or on the road. The strikingly styled side skirts house either the energy storage units or hot-swappable battery packs. Changes in the colour of the illumination of the side skirts indicate the operating and charge status of the energy packs. A roof carrier and additional lamps are integrated into the roof. The ensemble appears to have been carved from a single piece. The overall package of this design model is a clean thing – stylistically and functionally.